Schuhplattler Gebirgstrachten Verein "Edelweiss", Inc. Since the founding of our Verein in 1933 eight presidents have served the Verein with pride and determination. They were Peter Diroll, Michael Blab, Anton Kronbeck, Sr., John Fassel, Albert Schreier, Jr., Walter Wieand, Tony Kronbeck and Randall Bracewell. Walter Wieand is the current president. In the early years, our country was in the middle of a depression and there was little or no money. 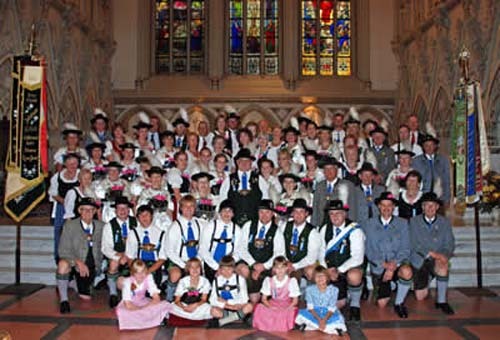 The first members overcame these hardships and celebrated their first Gründungsfest (anniversary) which brought together many local Vereine and Trachten Verein "Alpengrün" of Rochester, New York. The Verein's first Fahnenweihe (flag blessing) was held in 1935 and in 1968 the second Fahnenweihe was in 1968. During the next several years the Verein members were very active in community activities preserving song and dance and participated in multicultural events. The years during the World War II were difficult because of the world events and the absence of our young Plattlers (dancers) who were now serving in the armed forces. However the Verein did not lay dormant because our older Plattlers at that time rallied in support of Verein events. During the 1950's and early 1960's many Schuhplattler Vereine from other cities sponsored Trachtenfeste(celebration of costumes and culture) in conjunction with Stiftungsfest (commemorative celebrations), or Fahnenweihe(flag blessing). Our membership began traveling great distances by auto and by bus to cities of Rochester, Detroit, Toledo, Washington, D.C., Milwaukee and New York City. In 1958 our Verein celebrated our 25th Anniversary with a Trachentenfest that included Preisplatteln (dance competition) and sponsored a second Trachtenfest in 1963 to commemorate our 30th Anniversary. In 1965 a special meeting of Schuhplattler Vereine was held in Milwaukee, Wisconsin which led to the formation of Gauverband Nordamerika (Federation of Schuhplattler Vereine of North America). As a founding member of the Gauverband our Vereine has participated in every biennial Gaufest. Several of our members have served as officers of Gauverband Nordamerik. Through the years our Verein has been active in hosting Gau events to include a General Delegates' Meeting in 1976 and the Gau Executive Board in 1981. In 1987 we hosted the Gauverband North America's 20th Jubiläums General Meeting in downtown Buffalo. Our greatest undertaking was hosting the 14th Gaufest in 1993, the 20th Gaufest in 2005 and the 26th Gaufest in 2017. Throughout the years we have supported other organizations whenever possible to include local German Vereine in the Buffalo area. We also have membership in the German American Federation of Societies in Buffalo. We have been active within a Bezirks (regional area) of Schuhplattler Vereine that sponsors Preisplatteln for our Jugend (youth) and we were part of the Wanderfest experience. Our Verein has attended numerous Fahnenweihe and Jubiläums for Vereine across the United States and Canada. In 2006 we traveled to Germany and toured Bavaria and during the tour attended a Gaufest. At home our Verein has supported many civic events through the years. We have worked with other ethnic groups and have participated in parades in Buffalo and Erie County. Our Verein sponsors a Frühlingsfest (Spring Festival), Strauss Ball and an Oktoberfest. We co-sponsor a Waldfest with the Spring Garden Association. We have also co-sponsored the first "Buffalo Harbor Oktoberfest at Canal Side" with the German American Musicians Association. Today's Verein leadership is primarily third and fourth generation that upholds the Bavarian customs and culture of our founders. It is through the efforts of Walter Wieand, our president, our officers and our supporting members that the Verein continues to foster the culture of the Heimat. It is with confidence that we will reach new goals in the next few years and we look forward to celebrating our 90. Jubiläum in 2023.